Victorian Purses and Amulet Bags in Bead Crochet by Ramona Lee starts us off. The gorgeous cover alone beckons anyone who loves both crocheted lace and antique beads, plus the finishing touch of luscious silk. Inside, diagrams show actual sizes for Rounds 1-4 of the crocheted lace centers. You've never tried beading before? Not to worry. The author leads rank beginners through the process of choosing threads and beading needles and holds your hand with clear diagrams as you string the beads onto your crochet thread. Ramona even guides you through working with your first hank of seed beads. Having crocheted with beads myself, I can assure readers that no step is left out. This clever mix-and-match book contains complete instructions to make three beadwork patterns and three crocheted lace patterns. By interchanging thread, stitch gauge and bead sizes, you can choose from twenty breathtaking Victorian-style bags, eight purses or wrist bags, and twelve amulet bags, those little tasseled charmers that our great-grandmothers wore with such dignity at lavish turn-of-the-century affairs. Eagle-eyed crocheters know that plenty of these were seen dangling from dainty wrists in the block-buster movie, Titanic. Instructions for four basic styles feature both traditional abbreviations and full-size, easy-to-see symbols. Haven't made elegant tassels before with bead caps to dangle from the bottom of these gorgeous bags? The author's directions are clear and concise here, too. But I must admit my favorite part of the book is the painstaking attention devoted to helping you shape the bags, and to line them. Ramona even provides actual lining patters, instructions to make "Gothic Wrist Straps" (handles for the bags), and all those important finishing steps that breathe "class" into each elegant bag. Making the irresistible, stunning Victorian Gothic bag on the cover now appears on my "must-do" list. I just may be invited to a lavish affair myself. My wrist will be ready! Front and back covers illustrate all bags in color. Inside, you will find 30 very clear black and white photos, diagrams and patterns. 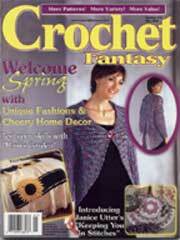 Victorian Purses and Amulet Bags in Bead Crochet, Ramona Lee, softcover: 92 pages, ISBN #0-9669856-1-3. Published by HB Publications ©1999.